Here at this page, you’ll have Civil Court Khanewal Process Server Jobs 2019 Apply Last Date. Jobs in Civil Court Khanewal are available and it is looking to recruit following position for the office of Senior Civil Judge (Civil Division) Khanewal and for this purpose it is looking to recruit vacant position of Process Server BPS-07. Recruitment for this post will be done on policy 2004 and Civil Session Courts Establishment Serving Rule 2005. Civil Courts have set 05% Quota for minorities and 20% Quota for employees quota and eligible candidates for this post can apply. 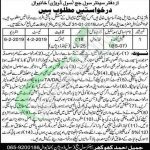 Candidates willing to apply should possess Domicile of Khanewal district and also possess qualification at least Matriculation in 2nd Division and age between 18 to 25 years. So, only suitable candidates fulfilling all requirements should apply along as per the following how to apply procedure which is according to the rules of Civil Court Khanewal. Applications along with attested copies of educational certificate, diplomas, experience certificate, CNIC, domicile and recent photographs should reach the following address given below. The last date for submission of application is January 31, 2019. Incomplete applications or applications carrying incorrect information shall be summarily rejected. A test will be held on 04th February 2019. Interviews will be held on 06th February 2019. Candidates are advised to bring original documents at the time of interview. Stay in touch with us and keep visiting our site JobsAlert.pk for more jobs. Last Date to Apply: January 31, 2019. Address: Office of Senior Civil Judge, Civil Courts, Khanewal.